Not all rainbows are as colorful as their reputation suggests. There are some spectacular monochrome rainbows, when the conditions are right. The cooler shades drop out of the rainbow, leaving bands of yellow, orange, and red. 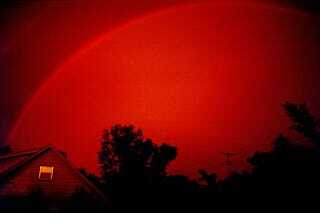 Sometimes the rainbow narrows down to a bright red streak of light. The rainbow goes monochrome simply because there are no other shades of light to be had. Sunsets cast a red glow on the world because the gas in the atmosphere scatters blue light, filtering it out. This isn't noticeably during the day, except as a slight lemony yellow cast to sunlight, but when the sun is at the far end of the world, with a lot of atmosphere between it and the viewer, the blue gets scattered away. For any rainbow to appear, there needs to be some water, and monochrome rainbows are likely to happen just after rainstorms, or during times of heavy mist. The water droplets further scatter certain wavelengths of light, intensifying the effect. As there is no violet, blue, green, or sometimes even yellow light for the water droplets to refract, the rainbow consists of an arc of red. Some people also see white monochromatic rainbows. When particularly thick fog or clouds scatters light less precisely than falling rain, light can still form an arc in the sky. The colors get mixed together, and the arc shows up as a large streak of white. It's basically a lit-up cloud. Has anybody here ever seen a monochromatic rainbow?